Members of UnKoch My Campus and FSU Progress Coalition have released a book-length report shedding new light onto Florida State University’s relationship with the Charles Koch Foundation and BB&T. Based on a year long investigation and hundreds of new documents obtained through public records requests, we have reconstructed a picture of donor influence at FSU from 2007 to 2017. There is good news, and also very bad news. In 2015, under pressure from our organization and the university community, FSU administrators decided to secretly discontinue (“sunset”) the controversial Koch agreement. This agreement gave the unprecedented donor influence over FSU's academic activities and administration in department of economics, including the creation of a program focused on "markets and institutions." On the same day we released this report, the Tampa Bay Times reported that FSU’s Hilton professor lobbying (literally) side by side with Koch lobbyists before the Florida legislature. Records requests reveal that Koch’s advisory board has control over graduate fellowship selection and dissertation topics in Koch’s graduate and Ph.D fellowship program, which has nearly doubled in funding every year since its inception. DonorsTrust, the "dark money" fund used by the Koch network, has also begun funding fellowships. Administration interfered in two faculty reviews of the Koch agreement, suppressing the top findings of the first 2011 faculty investigation. 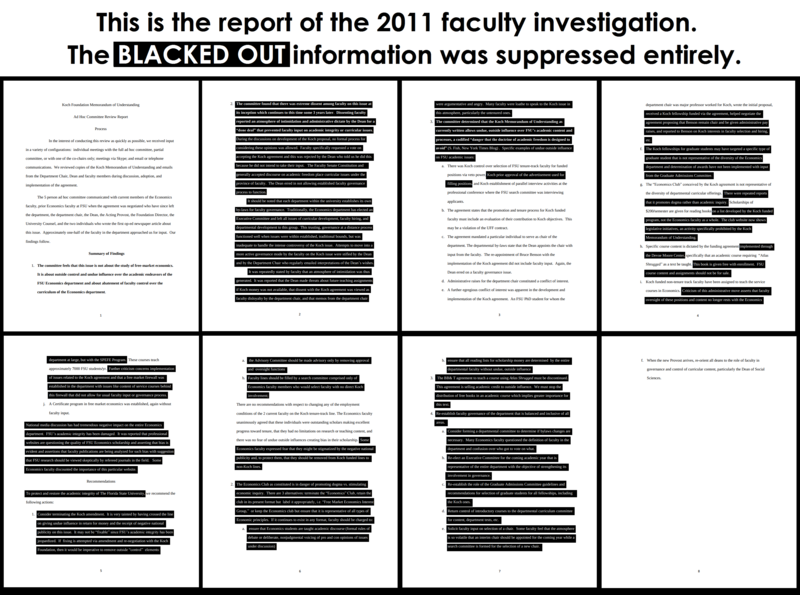 Most of the original 2011 faculty investigation was suppressed. We have blacked-out the portions that were omitted entirely. Click here to zoom in and read them. Koch’s “Undergraduate Program” involved donor creation of several new courses, donor influence over at least nine courses, and donor control over introductory “principles” courses. The “principles” courses specifically are estimated to reach approximately 7,000 students per year, both majors and non-majors. Key administrators (including the president, trustees of FSU, and trustees of the FSU foundation) had ties to Koch and BB&T while the 2008 agreement was being negotiated, including the chair of FSU's board of trustees, Jim Smith, whose son became a registered lobbyist for Koch Industries in 2007, and BB&T's Nan Hillis, a trustee of the FSU foundation whose husband Mark was a trustee of FSU. Koch’s 2016 donation to FSU includes $150,000 for the Project for Accountable Justice (PAJ), a corporate funded “criminal justice” think tank. The PAJ holds ties to corrupt private corrections contractors and pro-corporate criminal justice efforts known as “Right on Crime,” led by the American Legislative Exchange Council (ALEC), the State Policy Network, and the Charles Koch Institute. The James Madison Institute’s Sal Nuzzo, who infamously bragged about the intentional use of misleading language in Florida’s anti-solar Amendment 1 in 2016, claimed to receive support from faculty at FSU’s DeVoe Moore Center while crafting the controversial amendment, for which we provide greater context. Charles Koch’s spending has shaped the political and cultural context of the entire country. His network is expanding its programs not only at FSU but at dozens of universities across the nation. Florida State was the first campus where the Koch foundation's influence was exposed in 2011. It was also the site the earliest faculty/student dissent. Campuses are the key to Koch’s theory of political change. As key members of Koch''s network continue to fill the Trump administration's appointments, it is vital that we continue to expose the abuse of our public institutions by those with the power and money and motive to do so. Help us fight for academic freedom. Join our movement. Yes! I am interested in volunteering.